Hi, I’m Iain, also known as “shanksi” and sometimes “Vikki’s husband”. I spend most of my days building software but love to get out in the hills when possible. 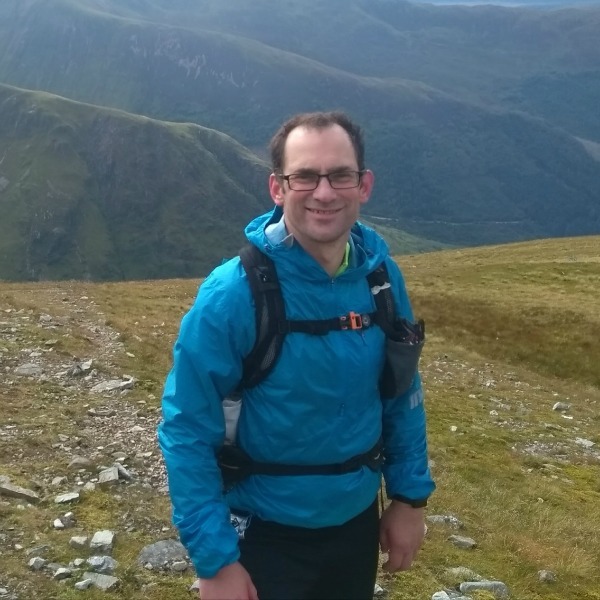 I’ve completed the Fling, the Cateran, Lakeland 50, D33 (8½ times), and a number of Mountain Marathons – the West Highland Way Race will be a step up in distance but hopefully that experience and some sensible training will see me through to Fort William. After crewing on six occasions (successfully, despite my runner’s best attempts to knock his brains out in the middle of the night on the Lairig Mor), and although I had previously said I just didn’t fancy it, it feels almost inevitable that I ended up entering the WHW Race and am now looking forward to the adventure ahead and hopefully collecting a crystal goblet at the end. It’s a great event, well organised, and running through some fantastic scenery. My only aim for the race is to complete it within the 35 hours and my race plan will hopefully allow me to do that with as little suffering as possible. I’m also looking forward to seeing many old friends and meeting some new ones along the way.